My pal Alan sent me this report from New Zealand a couple of weeks back. If anything makes me want to go 'down under' this is it. Alan should be paid by the NZ Tourist Board. It sounds like the weather in your part of the world is not too flash at present with lots of rain and cold spells. I enjoyed your articles on live baiting for Pike. They are an awesome looking fish. We have just returned from our holiday in Waiheke Island totally relaxed and invigorated. Unfortunately the wind that has been swirling around NZ for months followed us on our holiday but it did not cause too many problems other than curtail one or two of our boat fishing excursions. Our days were largely spent sleeping in until mid morning, exploring the sites (which inevitably involved lunch at a vineyard – everything from world class wood fired thin crust pizza to Vintner's lunches (think Ploughman’s with a twist)), afternoon swims, games of beach cricket, reading, playing cards and a spot of boat fishing when conditions permitted. We only managed four sessions in the boat and I had one shore fishing session from the shore of the bay we were staying in when all of the swimmers retired for the day. The first day's fishing centred around one of the channels on the south side of the island. We left the boat ramp at high tide and fished the ebb tide for around 3 hours before the wind sprang up from the south west and made it too sloppy to continue. The tide rip in the channel was ~ 2.5 knots which made it very difficult to keep the baited leger rigs on the bottom where the sounder showed the fish were holding. The boys and Sandy fished with conventional leger rigs with circle hooks and I used a leger rig fitted with either flies or Gulp! soft plastics. Interestingly a stream of small Snapper pounced on baited rigs as soon as they touched down whereas I struggled to get more than a tentative nibble no matter what I tried. I persevered with jiggling soft plastic for about two hours (including changing positions in the boat) before giving in and adding small tempters of bait. In hindsight, I am sure a used tea bag would have attracted more interest than the soft plastic lures. I started to get bites as soon as bait was added but the level of interest was still much lower than a simple baited circle hook. Tim managed to catch a brace of Snapper the biggest of which weighed around 1.2 kilograms and they were a handful on his light rod (see attached photograph). Once he got the fish off the bottom they swam in unison and offered their flanks to the flowing tide and drifted downstream so it took some effort to steadily work them back to the boat. He was convinced it was a single large fish and was disappointed to have two smaller fish attached when he finally got the trace boat side. We noticed that there was a lot of bird activity in the distance throughout the morning. Small Kahawai schools were shepherding 5 cm. 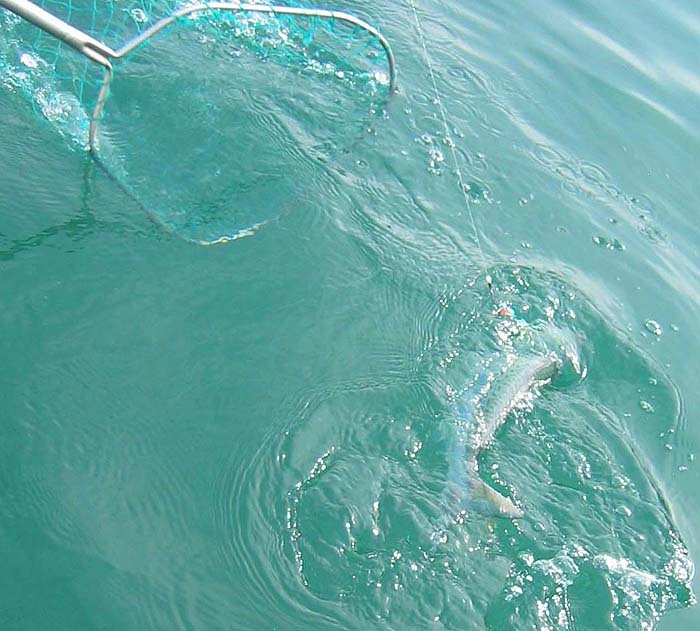 bait fish into balls on the surface to be picked off by terns and fish alike. The boys decided that trolling lures for Kahawai looked much more exciting than drowning bait so a plan was hatched to target Kahawai on our next trip out. Unfortunately our boat is too small for 4 adults to safely cast from so spinning for Kahawai was really not an option. The second trip out was in the late afternoon when the weather was a little cooler (most days were averaging 25 – 30 degrees C with high humidity). We left the boat ramp at 5 pm. which was two hours after dead low tide. No sooner had the boat cleared the entrance to Matiatia harbour than we came upon a significant Kahawai work up. 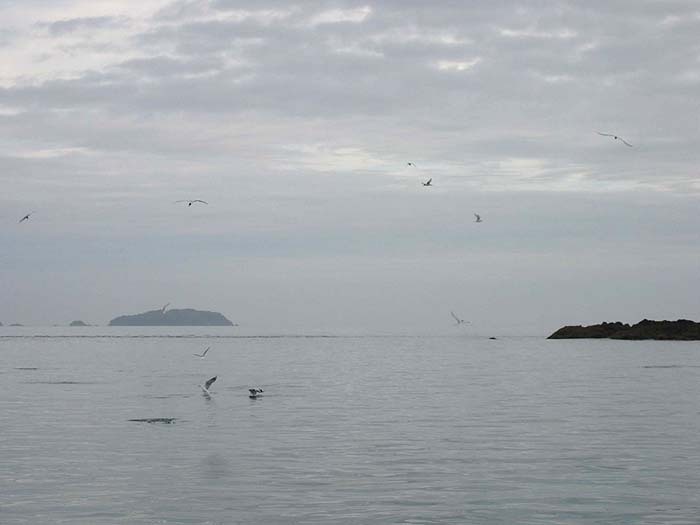 The terns were diving into the maelstrom and the Kahawai were splashing noisily over about a ¼ of an acre. We immediately slowed to around 2.5 – 3 knots and deployed two lures, a Rapala rainbow trout Tail Dancer and a Rapala Magnum CD-11 Mullet (top and bottom lures in the attached photograph). The boys manned the rods, Sandy took the helm and I adopted my traditional role of Ghillie. Experience has taught us that carefully skirting the outer edges of the workup works best and prevents the school sounding prematurely. Hamish was into a fish within five minutes and it absolutely smacked the CD-11 lure. He quickly managed to turn its head and work it steadily back to the boat. The fish, which was ~ 3 lb., took to the air as it neared the boat and after a short series of jumps was drawn steadily into the net. This pattern was repeated four more times within the next 25 minutes as he landed a further two fish identical to the first. Two fish were lost when they took to the air close to the boat and shook their heads determinedly. Tim did not have any touches despite switching lures. The work up dispersed after about ½ an hour so we opted to find a suitable spot and fish with bait until sunset. Once again I persevered unsuccessfully with Gulp! soft plastic while the rest of the crew winched in undersized Snapper with reckless abandon. We kept a couple of Kahawai for dinner the following night and did not keep any Snapper for the table, despite a couple being well above the legal size of 27 cm. I rigged up my spinning tackle and worked the length of Palm Beach with hard bodied lures and soft baits one evening after dinner. During the day Palm Beach was alive with swimmers, body surfers and nudists (the far secluded end) but once the sun dropped beyond the horizon the beach was deserted. I waited until almost dark as the prospect of extracting a set of needle sharp trebles from the trembling nether regions of a startled male nudist did not hold any appeal. (The boys counted and there were 28 male nudists and only two females so the odds of striking a male were way too high for my liking!) Nothing touched the bibbed minnow but the jig head rigged Eddystone eels were a major success on the small Kahawai that were moving in the surf zone. They were taking the lure short and it was possible to feel every pluck at the tail through the braid. The home made jig heads worked brilliantly but it was almost impossible to hook up despite varying retrieves. I finally managed to mouth hook a middle-finger-sized Kahawai in the waves lapping the shore which was most embarrassing. Luckily it fell off before Sandy could take a picture! The next boat trip out was an early morning effort. We all managed to drag ourselves out of bed at 6.30 am. and launch the boat from Matiatia harbour by 8.00 am, which was two hours after dead low tide. The sea was mirror flat and the poetic phrase “painted boat on a painted ocean” sprung to mind. Once again the Kahawai were feeding voraciously at the mouth of the harbour. Everyone adopted their designated role for trolling without discussion or hesitation. 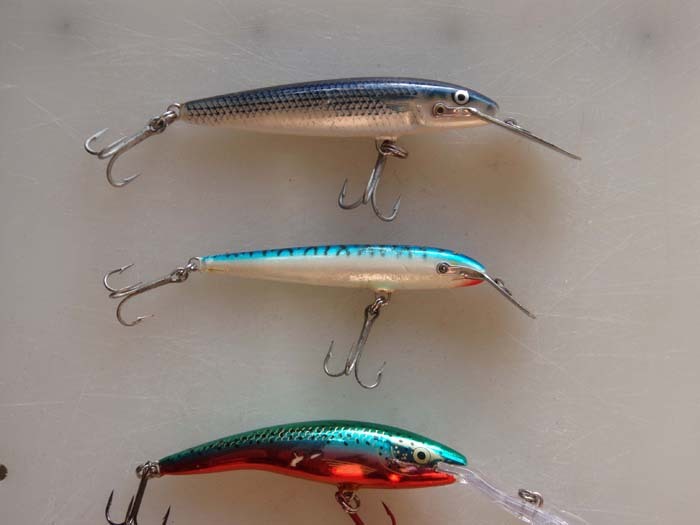 The previously successful CD-11 Mullet lure was promptly deployed along with a Rapala CD-7 Blue Mackerel lure (middle lure in the attached photograph). Hamish was once again into a fish almost immediately and this smoked line from the spool at a steady rate. We all thought that he was into a large ocean going Kahawai and prepared for a long battle. It took about 5 minutes to bring the fish to the surface and imagine our surprise when two Kahawai, and not one, took to the air simultaneously both attached to the same lure. 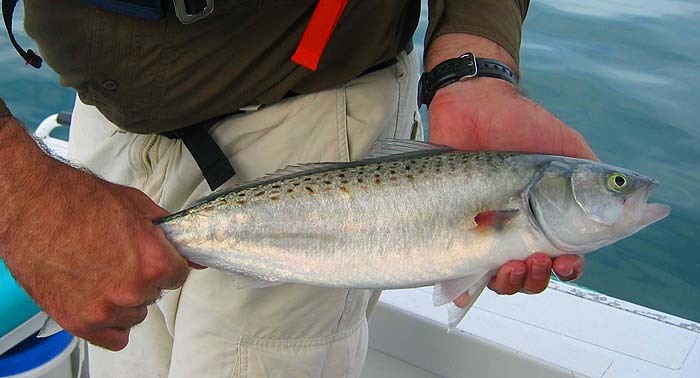 The jammy sod had managed to hook a Kahawai on both the belly and tail treble. Sandy unfortunately could not get a photograph before one fish fell off. I have seen descriptions and pictures of this in local fishing books but this is the first time I have seen it in the flesh. We kept on fishing for about 45 minutes before the school dissipated and caught and released 10 fish, all of which were between 2 – 4 lb. Another 4 fish fell off when they took to the air and we had three double hook ups. Marvellous fun! The CD-11 lure out fished the CD-7 by an impressive 2: 1 ratio. We also noticed that two Kahawai had identical damage to their right side pectoral fin. Is there a logical reason for this? (see photograph). After the Kahawai sounded we again opted to do some bottom fishing with bait and tried a couple of spots. The furthest was Gannet Rock which was around 15 nautical miles from Matiatia harbour. We tried live bait (a small rock cod), kahawai heads, squid and pilchards for bait but did not catch any snapper over our boat limit of 32 cm. My distraction with Gulp! soft plastic continued unsuccessfully and I am now convinced that the lack of inherent movement in the Gulp! lures is the problem. Our final fishing trip was timed to coincide with the mid morning arrival of a ferry carrying Tim’s best friend, Logan, to Waiheke for the day. We collected Logan at around 9.45 am and steamed straight out of the Matiatia harbour with the aim of targeting Snapper. For once no Kahawai were working at the harbour entrance so there was no temptation to stop and troll. As we neared Spot X a Kahawai work up started close by so we had two quick passes and Hamish picked up a fish on the CD-11 (see photographs of the work up and the fish being netted). The activity was short lived so we anchored up and set about bottom fishing in earnest. The tide rip was fierce and it was difficult to keep 8 oz. of lead on the bottom, even with thin 20 lb. braid. There were no bites for around 1 hour so we opted to move elsewhere. We encountered another kahawai work up en route to the next spot and set about trolling. To cut a long story short, Hamish, Tim and his friend landed and released 17 Kahawai over the next two hours with many others lost shortly after take off! Once again the CD-11 was significantly more successful in hooking up. (I checked Frank Prokop’s Lure encyclopaedia when I got back to Auckland and discovered that the CD-11 lure tracks about 1 metre deeper than the CD-7 with 20 metres of line out at 2.5 knots. The action is also slightly different and the CD-7 works best if trolled a little faster. Amazingly all of the other lures trialled tracked at the shallower depth so this may explain the success of the CD-11). The CD-11 lure hardly ever aquaplaned to the surface even when the helmsman executed relatively tight turns whereas the CD-7 was prone to splash on the surface under these conditions. This may also have been a factor in the relative success rates. I should mention that the CD-7 has caught around 70 fish and was previously our most successful lure. After trolling around the school for ~ 1 hour the action ceased and we opted to drift and fish on the bottom with leger rigs. The wind was moving the boat fairly steadily and it looked like a drogue would need to be deployed to slow us down when the rod Logan was holding got smacked by a decent Snapper. Hamish had loosened off the drag and engaged the clicker at the end of the trolling session so the reel screeched in protest when the fish grabbed the bait and took off. Once I calmed the team down and sorted the reel settings out Logan was able to work the fish steadily to the boat. 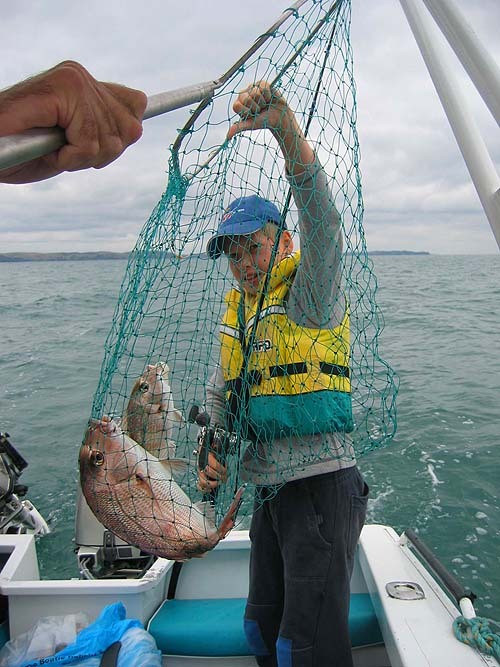 The fish gave a spirited account of itself and it weighed around 1 kilogram in the net. We continued to drift for a further 30 minutes but by now it was nearing lunchtime and the hollow legs of the boys overwhelmed their desire to fish so we headed home. All in all it was an excellent holiday. My only regret is that I would have liked to have targeted the Kahawai a couple of times on a spinning or fly rod. It is amazing that such good fishing is available so close to the largest city in the country. We are indeed privileged. I have also finally convinced myself that Gulp! is not more effective than bait, despite the marketing puffery to the contrary. There I told you it was good stuff! Now look at the pictures - what a place! Tim with two fine snapper.